After being briefly suspended with pay for protesting at a Royal Dutch/Shell recruitment meeting, MIT employee Henry D. Sterrett has been reinstated as an administrative assistant for the Dupont-MIT alliance. 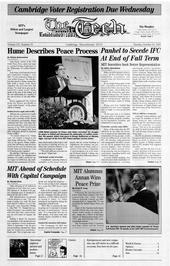 Sterrett’s suspension raised questions about freedom of speech at MIT, especially concerning the Institute’s corporate ties. Sterrett was suspended at the end of the business day on October 5 as a result of his participation in a protest at a Shell recruiting event the night before. The protest was initiated by the MIT Social Justice Cooperative in response to alleged environmental and human rights violations by Shell. In addition to handing out flyers, one of which read, “Why Shell? Because we get the job done at any cost,” protesters voiced their concerns during the question and answer portion of the event. On Friday afternoon, Audrey Jones Childs, director of administration for the Biotechnology Center, handed Sterrett the letter of suspension pending review which, Sterrett said, “came as a real shock.” Neither Reilly nor Jones Childs could be reached for comment. “This incident demonstrates the need for the MIT community to question MIT’s relationship to corporations,” Sterrett said. The SJC launched an e-mail campaign to President Charles M. Vest and Provost Robert A. Brown over the weekend following Sterrett’s suspension. According to Brown, Sterrett was reinstated on October 9 after a “senior administrator reviewed the case as fast as possible with all the facts.” Brown said that the petitions from SJC did not influence their decision. He also says that Shell was not involved in the initial decision to suspend Sterrett. Rima Arnaout contributed to the reporting of this story.